We decided to drive to the north of the continent through Argentina instead of Chile. We pass through the provinces of Mendoza, San Juan, La Rioja, Catamarca, Tucumán, Salta and Jujuy. And then we went back to Chile to visit San Pedro de Atacama, place famous for owning the driest desert in the world. I already explain you how it was in Mendoza and San Juan at the entry “Felices los cuatro“, we just past through La Rioja, Catamarca and Tucumán and we really enjoyed Salta and Jujuy. In Salta we fell in love with Cafayate, a small town but with a lot of personality, where we start to see typical houses made of adobe (clay), colorful clothing in all corners and many cacti! We noticed also a change in the faces of the people, who are no longer just like us, like in the south where most have Spanish or Italian descent, they look more different, descendants of native or indigenous people. To get to Salta capital from Cafayate you have to go through one of the most beautiful routes we have ever seen, Quebrada de las Conchas. This place has a great scenic beauty due to its rocky formations of reddish colors and super striking. And we were fortunate to travel with 3 beautiful Kombis or VW T2, three couples of travelers like us, the green kombi are Americanofrenchpress of which we had already spoken in the previous entry, the yellow kombi are our friends Expediçao Margarita which we know from Ushuaia and we have been crossing our paths in different points and finally the turquoise kombi are Esmeralda Viajante, to whom we just met but we really like! We arrived in Salta capital and we settled in a camping to rest a little, to wash clothes, to shower, to have internet … In the end we were there for 1 whole week, but the truth is that we needed it, from Santiago till there we didn’t stop even one day! For the first time in the 6 months that we were traveling I became sick… I woke up one of the nights at 3 am and vomited several times … and then I had diarrhea several days … Jose and some others of the group also didn’t feel well, so after thinking we realize that it was water’s fault. Most of the time we bought bottled water to drink but this time we drank from the tap… We assume that was the mistake … so from now on, never again !! It was a really bad experience! In the city we visited the center with its beautiful cathedral, San Bernardo hill and the MAAM museum where we saw one of the mummies of Llullaillaco. 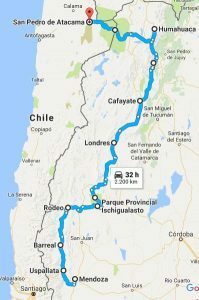 We continue to Jujuy by Route 9 that after a lot of curves by a very narrow road took us to San Salvador de Jujuy, the capital, but we didn’t stop there, we continued to the Quebrada de Humahuaca. We visited several villages in the Quebrada, the first one was Purmamarca, where is the famous Hill of the 7 Colors, from which personally I was not very impressed since days before we had seen one in Uspallata, not so touristy and more spectacular. The next stop was Tilkara, where the most remarkable was the visit to Pucará in which we were accompanied by a very passionate guide who explained us a lot of things about the culture of Humahuaca and the subsequent invasions, the Inca and the Spanish. Along the Quebrada there are many Pucaras, these were fortresses located at strategic points where the natives lived. And the third and last stop was in Humahuaca, where in addition to walking through its beautiful center and buy handicrafts, we visited the Hornocal or Cerro de los 14 Colores. The road till there was very difficult, in 25 km of gravel we climbed an unevenness of 1700m to reach the 4761m from where you can see the beautiful landscape formed by hills that look like hand painted. Something very funny of what we realized visiting this Quebrada is that King Africa speaks of it in his famous song Carnavalito, now we can’t stop to sing it in our heads !! After the Quebrada de Humahuaca we went to Chile, on the way we visited Barrancas and its incredible cave paintings and petroglyphs of more than 1000 years old and also we spend the night in the Salinas Grandes, where we lived a magical night of full moon. Click here for more pictures about Salta and Jujuy. We entered in Chile and the first stop we made was in Salar de Tara where there are some rock formations that emerge from the desert in a very rare way. We were off-roading and then the disaster happened!! We got stuck in the snow… again!! And this time we were alone… it took us about 4 hours to find a solution, we had no shovel or aluminum plates… so we beat snow with everything we could find and in the end we built a path with stones under the wheels and it works! After so much adventure we arrived in San Pedro de Atacama exhausted, we rested one day in a camping and the following days we visited the two great tourist attractions. First is the Valle de la Luna, which is formed by salt caves, rock formations and large sand dunes. And second are the Geysers of the Tatio, a place where the heat of the earth heats the groundwater and expels it to the outside with great force forming these geysers and fumaroles that can measure 10m of height. Click here for more pictures about San Pedro de Atacama. Did you know that the Incas made human sacrifices? Holaa!! Everything ok!! We are already in Peru! I have to update the site! !